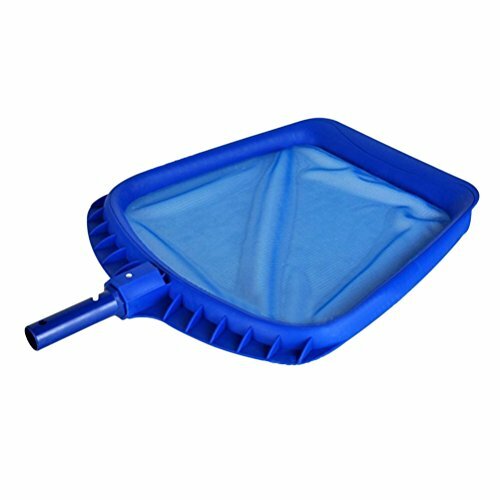 VORCOOL Leaf Rake Mesh Frame Net Skimmer Cleaner Swimming Pool Tool Suitable for Cleaning Swimming Pool(Blue) | Fountain City Art Ctr. This item performs its founction as a cleaning mesh for clean the swimming pool in order to create a tidy environment for swimmer. It is made of high quality plastic frame for long-lasting use. The net is designed to scoops out leaves, bugs and other kinds of debris from your swimming pool, pond, hot tub, fountain or large fish tank. - Function: a cleaning mesh for clean the swimming pool in order to create a tidy environment for swimmer. - High quality material for long-lasting use. - Net: designed to scoops out leaves, bugs and other kinds of debris from your swimming pool, pond, hot tub, fountain or large fish tank. - Bracket design: it is convinent to disassemble. Function: a cleaning mesh for clean the swimming pool in order to create a tidy environment for swimmer. High quality material for long-lasting use. Net: designed to scoops out leaves, bugs and other kinds of debris from your swimming pool, pond, hot tub, fountain or large fish tank. Bracket design: it is convinent to disassemble.